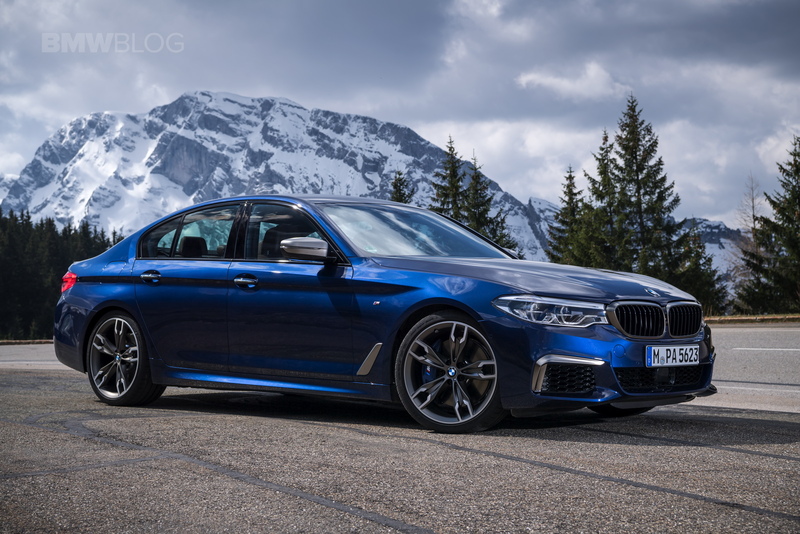 For the new G30 5 Series, BMW replaced the old F10-generation BMW 550i with an M Performance alternative and the world couldn’t be happier about it. On paper, the new BMW M550i is capable of some rather incredible performance, BMW claiming it will actually be faster to 62 mph than the outgoing BMW F10 M5. Judging by the video posted at the bottom of the page, this definitely seems to be the case, with the M550i looking blazing fast not only to 62 mph but going all the way up to its electronically-limited top speed. To be more precise, the BMW M550i does come with xDrive and that helps when it comes to putting down the power at launch. The 4.4-liter twin-turbo V8 under the hood was tuned to make slightly more power than the outgoing unit that used to be fitted on the F10 550i. In this application the N63 mill makes 462 PS and 650 Nm (479 lb-ft) of toque which definitely seem enough to turn it into an Autobahn beast. As you’re about to see, the M550i also reaches its limiter with plenty of power left in the tank, the 250 km/h (155 mph) threshold being reached in 6th gear. Since the car comes with an 8-speed ZF automatic gearbox, we can only assume that going up to maybe 300 km/h (186 mph) might just be doable if the electronic nannies weren’t there to keep things in check. Of course, one has to wonder where that top speed could actually be reached if you don’t live near an unrestricted Autobahn but that’s a different topic altogether. And while we’re still waiting for M5 deliveries to kick off, some people are already enjoying the G30 5 Series chassis with plenty of power aboard the M550i, like the lucky guys from AutoTopNL, in the video below. Truth be told, it definitely looks like a lot of fun already and since the F90 M5 will take things up to a whole new level, we just can’t wait to get behind its wheel in the future and see what it’s capable of.